SeizureTracker.com - Using the Seizure Tracker Logging page. Seizure Triggers - Easily log seizures triggers and causes through the Seizure Tracker event logging interface. Seizure Description - Easily log seizure descriptions through the Seizure Tracker event logging interface. Post Seizure Description - Easily log "Post event" descriptions through the Seizure Tracker event logging interface. Seizure Types - A comprehensive list of seizure types and descriptions used on Seizure Tracker. This list used only be used as a guide. Please consult with your epilepsy related care giver to determine which apply. Edit or Delete a Seizure log - Edit or delete a seizure entry from the seizure logging page. From this page the user can log seizure events, schedule appointments, edit the regular and rescue (if activated) medication schedules, and record daily notes. At the top of the page the current day is in bold. Below that is the number of events logged, the age of the subject and any scheduled medications active on that day. In the top right corner is a one-month calendar similar to the control panel month calendar. Again, each day on the calendar links to the corresponding event logging page. The user can jump forward or backward by month or by year. The middle left portion of the page is the event logging section and consists of four basic parts: the header section, the possible trigger section, the description section and the post event section. There are printable forms that correspond with the online event logging form on the support documents page (accessible through the Control Panel). 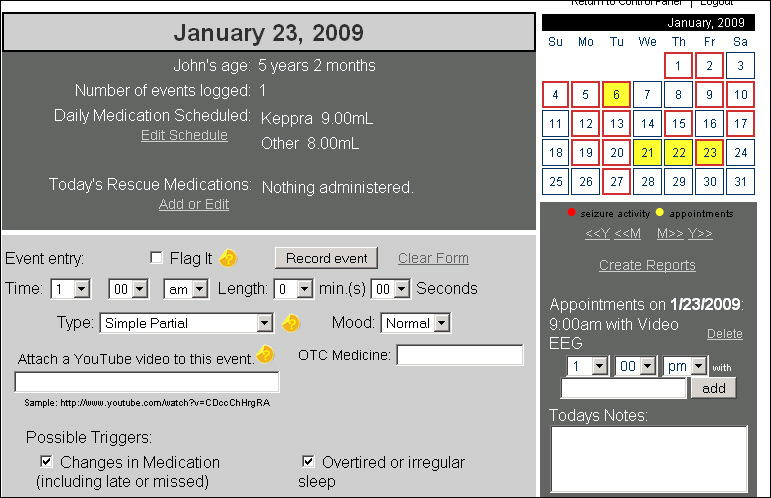 The header section includes a "Flag it" selection used to differentiate an event when creating reports, a record event button, a clear form link, the time and length of the event, the type of seizure, subjects mood at time of seizure, and any over the counter medications (OTCM) being taken. Also availible is the option to attach a YouTube video to each event. Reports created on the site will indicate wheather a video has been attached to a particular event and provide a easily accessible link to that video. 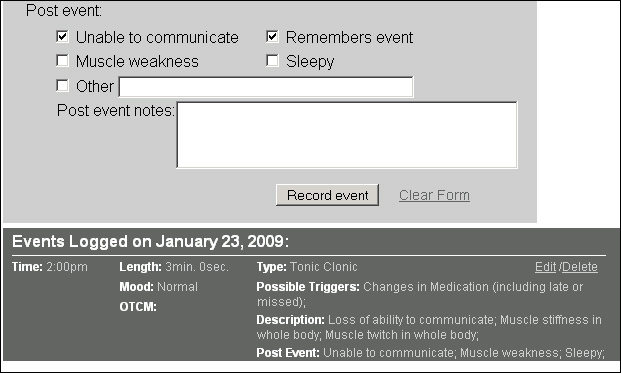 Directly below the event logging form is a list of all seizures logged for that day. The user has the option of editing or deleting each individual entry. To the right of the event logging form and below the one-month calendar is a Link to the report page, the section to enter appointments and the daily note box.